Samsung announced a new phone - the Galaxy S Plus. 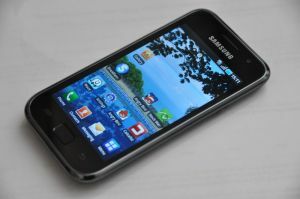 This is (yet another) Galaxy S variant - with a faster 1.4Ghz processor and Android v2.3. The new phone will be released in Russia towards the end of April for 23,990 rubles (around $850). The display is the same as on the Galaxy S - 4" WVGA Super-AMOLED. Samsung's Galaxy 2 Android Phone to have a 4.1" AMOLED?